Focal Utopia review | What Hi-Fi? We like a bit of ambition, and Focal has been nothing if not ambitious with these Utopia headphones. While their eye-watering price will get people talking, we think their technology is even more interesting. Best known for its wide-ranging and talented speakers, this French manufacturer has been plugging away at headphones for a number of years now, without ever making the kind of impact that would get the big players to notice. 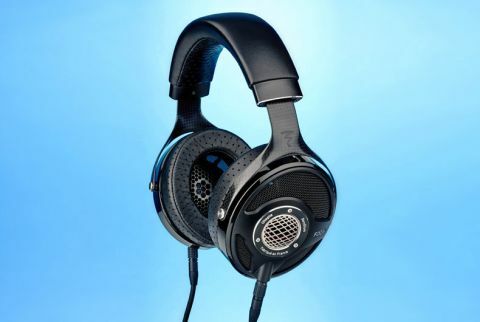 Focal’s headphones have been mostly middle market and solid as far as sound is concerned, but nothing in the company’s catalogue prepared us for the arrival of the Utopias. Focal has never made headphones as pricey as these, or anything that even hinted at so much ability. Its 35 years of speaker design experience shows here. The highlight is the 40mm Beryllium drive unit, which covers the frequency range from 5Hz to 50kHz, and is shaped to deliver exactly the kind of dispersion the engineers wanted. The company is already strongly associated with Beryllium drive units, thanks to its use in the brand’s high-end tweeters, and the material’s combination of low weight, rigidity and damping works equally well in this application. The use of a single drive unit doesn’t give the engineers much room to tailor the performance. There’s no crossover to adjust or multiple drivers to balance, just the cone material, diaphragm shape and surround to play with. If there’s some drive unit flaw it can’t be hidden and is harder to correct. Fortunately, Focal has built its business around drive units, and has been developing them for decades, so if anyone can make a single driver configuration to work properly it can. The Utopias are an open design – a help for the engineers tasked with getting them to sound good, but a pain for everyone who hears Springsteen’s Born To Run as you rock out. Openness goes both ways, and you’ll find all sorts of noises intruding on your experience if you don’t find a quiet place to listen. They’re comfortable though, and that’s despite a weight of 490g. This is down to a careful shaped and nicely padded headband (that suits a wide variety of head sizes) and a sensible distribution of mass. Both the headband and nicely cushioned memory foam earpads are covered with some wonderfully tactile lambskin. The open design means that long listening sessions don’t end with hot, sweaty ears, either. As you’d expect at this level, these Focals are built beautifully, combining leather, carbon fibre and metal to produce a product that feels like it’ll last for years. The earpads are easy to replace, which bodes well for a product that should be in use for decades. The ’phones are supplied with a surprisingly heavy 4m long lead, which is terminated at one end by a sturdy Neutrik 6.3mm jack and the other, earpiece end, by a pair of two-pin lockable Lemo connectors. The cable is shielded and uses high quality oxygen-free copper and is designed for low impedance characteristics. If you want to hear these Utopias at their best you’ll have to feed them with a quality signal. While we’re all for using smartphones and tablets as music sources, it means you’ll only get the loosest idea of what the Utopias can do. We use a range of sources, including our reference Naim NDS/555PS streamer and an Apple MacBook Pro loaded with Pure Music media software. Chord’s multiple award-winning Hugo and Benchmark’s excellent DAC3 HGC deal with digital conversion and amplification duties. Some people will never be able get past the Utopia’s price, but if you can, it doesn’t take long to realise they’re among the very best sounding headphones that money can buy. It’s important to remember that even at this price they’re nowhere near the most expensive around. We start with Light Of The Seven from the Game Of Thrones Season 6 OST and like their natural unforced balance. It’s so precise and information-packed without ever sounding the least bit over-analytical. We become aware of instrumental textures that even talented circa-£1000 headphones like the BeyerDynamic T1 Gen.2s and Sennheiser HD800S can’t resolve. In comparison both of these sound blurred and lacking in resolution, which by most standards they aren’t. Focal has done a great job with that drive unit. The Utopias are refined and wonderfully smooth performers that still have enough in the way of bite to satisfy. There’s a lovely sense of weight and authority to their sound, and the ability to deliver huge dynamic sweeps with composure. It’s a spacious presentation, where each instrumental strand has space to stretch out and express itself. Tonally, things are nicely balanced, with no part of the frequency range getting undue emphasis. We’re glad Focal has avoided the current trend towards excessive bass. What we get instead are wonderfully extended lows that brim with agility and punch, but also blend in seamlessly with the organic midrange. Adele’s Hometown Glory highlights that midrange further. Her voice comes across with power and emotion, while the instrumental backdrop is organised and cohesive. The Focals reveal the build-up in musical tension superbly, thanks to their startling insight and sonic stability. These headphones are revealing but don’t go out of their way to highlight the harshness in a recording. This is a nicely judged balance that means the Utopias work well across a wide range of recordings. Moving to Kendrick Lamar’s King Kunta simply reinforce our views. There’s plenty of kick to that deep, grungy bass and a pleasingly surefooted way with rhythms. These headphones pound out the hard driving beat superbly, while giving Lamar free reign with his highly charged vocals. We’re left a little breathless with the energy on show, as well as the detail resolution. Throughout the test we find that the Focals reveal elements of a recording that we’ve never heard before. Sometimes these give us a new view of the music being played, other times they simply embellish what we already know. Either way, it’s clear that these headphones are mighty talented. Are they talented enough to be worth £3250? For the right person, we think so. Focal has aimed for the moon when it comes to performance, directing its flagship offering straight at the very best the headphone establishment can manage. It has succeeded.